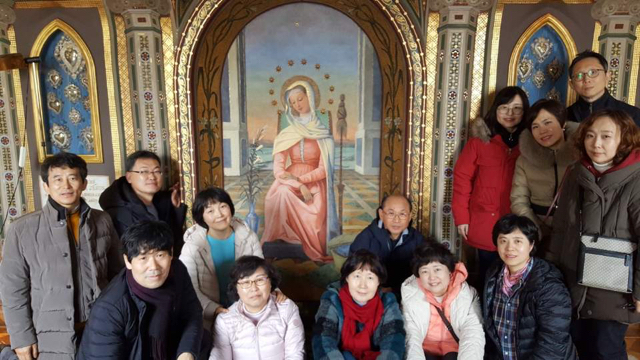 The Sacred Heart - Korea pilgrimage group in Joigny and Paris. The Sacred Heart - Korea pilgrimage group at the Villa Lante in Rome. our collaborators and companions in mission. shares about their group's experience during their pilgrimage in January. Asked to share about my experience of St. Madeleine Sophie, I looked back at our pilgrimage last January 9-17, 2018. Twelve Sacred Heart teachers from the middle and high schools joined that pilgrimage to France and Italy. Though that was my second time in Europe, as a history teacher I was thrilled to see the country and cities of Catholicism, I looked forward especially to visiting the hometowns of our two saints: Madeleine Sophie Barat, the founder of our Sacred Heart School; and Philippine Duchesne, our first missionary. The most meaningful part of the trip was our visit at the church of St. Francis Xavier in Paris, which holds the mortal remains of Madeleine Sophie Barat. We also went to the Centre Sophie Barat in Joigny, the place of her birth and childhood. An RSCJ, Rachel Guillien, explained Sophie’s life to us, and I was touched deeply not only by what she shared, but more so by the strong spirit that she exuded and the passion with which she spoke. We then went to Grenoble, the old city in the foothills of the French Alps, which was home to Philippine Duchesne, a pioneer of the Sacred Heart mission in North America. Sophie’s passion and Philippine’s perseverance leave an important mark in my heart. From France, we visited some places in Italy: Torino, Florence, and Assisi. Then we went to Rome, where we visited the Vatican Museum under the expert guidance of a person who is majoring in art history. I am sincerely grateful to the Society of the Sacred Heart for giving us this precious opportunity. I hope that more teachers would join this pilgrimage because it broadens our knowledge and insight. It also deepens our commitment to carry on Sacred Heart education in our school. The pilgrimage group with Mater Admirabilis at the Trinita dei Monti in Rome. Lee Chang Ho, the author, is the man seated to the left of Mater.